Water crises are the biggest risk that the Middle East and North Africa are least ready to face, according to a 2015 World Economic Forum survey. Next came fears of the fragility of the state in the form of social instability, state collapse and interstate conflict. These were viewed as existential threats to the prosperity and well-being of millions of people living in the region, according to the survey. The findings were cited in a recently released report “Water Management in Fragile Systems: Building Resilience to Shocks and Protracted Crises in The Middle East and North Africa”. Jointly prepared by the UN Food and Agriculture Organisation and the World Bank, the report warns that instability combined with poor water management can become a vicious cycle that further exacerbates social tension. 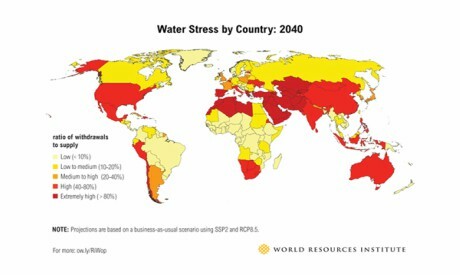 According to the report, more than 60 per cent of the region’s population is concentrated in places affected by high or very high surface water stress, compared to a global average of about 35 per cent. Under a business-as-usual scenario, the report said, climate change-induced water scarcity could lead to a decline in regional GDP of between six and 14 per cent by 2050. This would happen on the back of “water-related losses in agriculture, health, income and property, and could send countries in the Middle East and North Africa into sustained negative growth”. “Economic losses mean rising unemployment, compounded by the impact of water scarcity on traditional livelihoods such as agriculture,” said Pasquale Steduto, FAO regional programme coordinator for the Near East and North Africa and co-author of the report in a press release. “The result can be food insecurity and people forced to migrate, along with growing frustrations with governments unable to guarantee basic services, which risks becoming another driver of the region’s widespread instability,” Steduto added. “Water scarcity is pervasive throughout the region and is getting worse,” said the report. Water resources per capita are one-sixth of the world average, it added. Among the features that characterise the region are several countries, including Egypt, Iraq and Syria, having access to very significant surface water resources that flow largely from outside their boundaries. Moreover, all countries in the region share at least one aquifer with a neighbouring country. And while agriculture is the biggest user of water, demand from other sectors is rising fast. Furthermore, the climate is not helping. Higher temperatures and more heat waves are expected together with lower and less reliable precipitation to be followed by increased frequency and intensity of droughts and floods and seawater intrusion into coastal aquifers as sea levels rise. These factors will “accentuate already severe water scarcity, increase existing high levels of aridity, and intensify unpredictability and the risks of extreme weather events,” said the report, warning of the major risks this poses for agriculture. And it is also affecting urban settlements. Already some cities are having difficulty sourcing water such as some urban households in towns in the West Bank and Gaza and in Yemen which receive network water less than once a month. One of the factors driving the scarcity according to the report is that in many countries of the region demand is inflated by an “incentive framework that encourages overuse of water, essentially by making it too cheap”. But it is not all gloom and doom in the report. There is a glimpse of hope provided the implementation of proper policies. Among these policies is the adoption of new technologies that rationalise the use of existing water resources. It pointed to the case of Egypt and other countries in the region which have demonstrated that drain water reuse can provide low-cost ways to increase water efficiency. In Egypt, 10 per cent of agricultural water is recycled drainage water, according to the report. It also suggested that “for high-value uses, particularly municipal and industrial, desalination will be a viable option in many locations, particularly in coastal areas, but the environmental implications of energy use and brine disposal require careful attention”. The report suggested that there are lessons to be learnt from Australia which was experiencing severe water shortages and over-allocation to agriculture and that the situation was worsening with climate change. According to the report, Australia developed the National Water Initiative that sought to return all water systems to sustainable levels of extraction, to manage groundwater sustainably and to respect needs for environmental water. This was done through an inclusive process to reach an agreement on objectives and on the initiative, which acted as a blueprint for the changes. Governance and institutions also play a crucial role. For example, a federal water department and its legislation were created where there were none before. The process was supervised by the prime minister and other ministers. Moreover, it was also overseen by an independent public assessor of progress. The report finds it essential to work together within countries and across boundaries. “Given the scale and commonality of the challenges, the relatively small size of many countries in the region and the transboundary nature of important issues like climate change and shared water resources, collective action and partnerships are essential,” one of the report’s key findings stated.